I love writing. It’s weird, i know. Wait, what’s weird? What’s weird about writing? Well, i had an interaction with a friend at a cafe once and he told me i can never make money from writing. I believed him and i didn’t because i didn’t try. That happened before Steve Job’s death in 2011. Two years later, I was in another cafe with my own laptop ( which was given to me by a Ceo i wrote for. I thought he borrowed it to me at first…LOL ) with some sticky notes on the right side of its screen (reminders) while i searched the web for “ways to make money online.”(That was before my first movie). Now, the secret to my making money online, building a blog from scratch, monetizing and starting all that “great tutorials and posts” you leave comments on today is attributed to Nigerian bloggers and Indians (i love Indians and Indonesians) and… let’s just come back home. While i was hustling for money online. Some Indelible Nigerian blogs really, really did the heavy lifting for me. I didn’t have to write the codes from scratch, they already put it there. I Just copied and and pasted the codes and they worked. I know you love copying and pasting, Don’t do it for contents. No one will write about you in retrospect if you copy contents. Anyways, the Ceo of one of Nigeria’s oldest blogs. 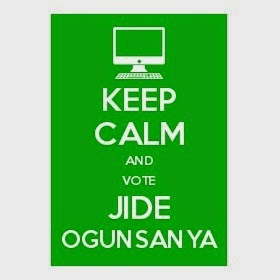 Let’s do that again, the Ceo of one of Nigeria’s most unique (ogbonge) blogs, Jide Ogunsanya needs your vote here. You could check his site out here for those that don’t know that wealth-mine. He has been here for a long time and he deserves it. He has been nominated for BLOGGER OF THE YEAR in NIGERIA….. the whole of AFRICA! at The Social Media Awards. Isn’t that huge? Bring the trophy home. We’re all counting on your vote. You could make it happen. All you need to do is: Follow this link and vote for Ogunsanya Jide by typing your email and clicking “Vote.” That’s all. It ends On Friday, Nov 28. It ends On Friday, Nov 28. You could vote on mobile (If one browser fails, try another.) BUT it’s best done with Pc and it doesn’t take two minutes – depends on how long it’ll take for you to type your email. Do it people. Just this once!